Brownies and cuteness? YES!! Don’t you just love when a recipe comes along that is easy and DELICIOUS! 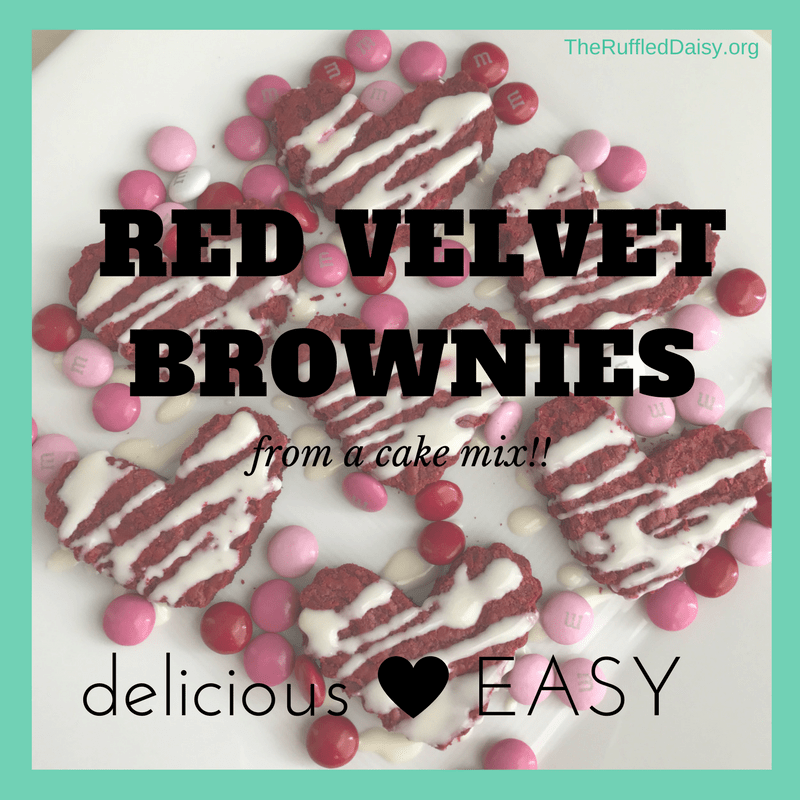 This simple recipe takes a simple cake box mix and is transformed into an amazing brownie!!! I used a simple heart cookie cutter for these and made them for Valentine’s Day but you could easily mix it up and use different shaped cutters for different holidays! How about a “STAR” for the 4th of July? Or a “CANDY CANE” for Christmas? Or maybe a “BALLOON” for a birthday party? 1t vanilla – this is my homemade vanilla extract – seriously HEAVENLY! Preheat oven to 350 degrees. Line a 9×11 baking pan with foil and spray with cooking spray. Mix cake mix, egg, butter, and vanilla until blended. Fold in 1/2 of the M&M’s. Press batter into the prepared pan and sprinkle with remaining M&M’s. Bake for 35-40 min until toothpick inserted comes out clean. This has got to be one of the easiest recipes I’ve ever shared with you! AND, I’ve included a recipe for you to print out – just right click and save to your computer 🙂 What holiday or celebration do you have coming up that you can make them for? Feel free to PIN it for later and share it with your friends! This is the perfect entertaining recipe because of the versatility of cutting the brownies into FUN shapes! Preheat oven to 350 degrees. Line a 9x11 baking pan with foil and spray with cooking spray. Mix cake mix, egg, softened butter and vanilla until blended. Fold in 1/2 of the M&M's. Press batter into the prepared pan and sprinkle with the remaining M&M's. Bake for 35-40 minutes or until toothpick inserted comes out clean. Then the FUN part comes! After the brownies have cooled, remove them from the pan and cut them into squares or be fancy and use a cookie cutter! My kiddos will love these!